The district court ruled that the Trade Secret award was duplicative of the Contract and Tortious Interference awards — and thus kept only the larger of those awards. All this was based upon the longstanding principle that “double recovery for the same injury is inappropriate.” Aero Prods. Int’l, Inc. v. Intex Recreation Corp., 466 F.3d 1000, 1017 (Fed. Cir. 2006). Still, the state law trade secret damages were more than 500 times greater than the federal patent law damages. Patent and Trade Secret? : One of the initial thought experiments for potential patentees is whether to (1) file for patent protection or instead (2) keep the invention as a trade secret. It turns out though that one of the jedi tricks of in-house counsel the art of layering rights rather than choosing rights. Counsel ask question: What must be disclosed in the patent application in order to obtain full rights? ; What information may be kept secret without endangering the patent rights? ; Can the product or process be divided into separate components so that some may be kept secret while others made public in patent documents? Is it possible to keep the patent documents secret for longer? Because early filing is so strongly encouraged in the patent system, it is regularly true that implementation details are developed after the filing date that are appropriately kept as trade secrets. Here, the alleged trade secretes included financial information on the costs as well as some technical information (the 1:1 interleaved array structure). The combination is a trade secret: The asserted patent discloses, individually, a 1:1 array structure and also the interleaving of shielded and unshielded wells. 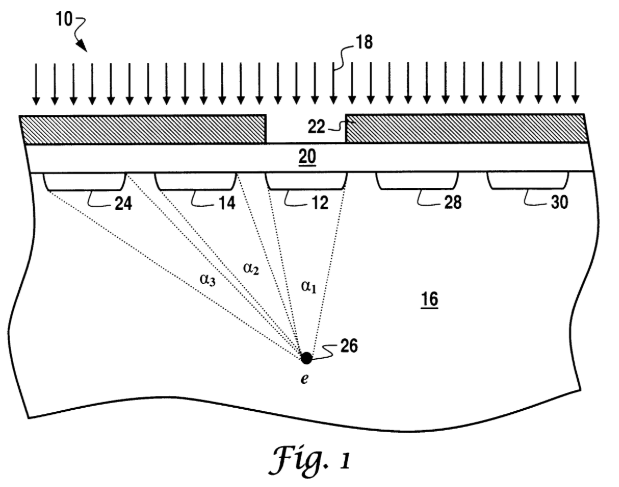 However, the patent does not disclose the combination, of the array and interleaving wells (despite the fact that both disclosures are in the same patent application). It was proper here – according to the court – for the jury to find that the combination remained a trade secret. Here, it appears that the trade-secret combination need only survive a novelty test. See Sikes v. McGraw-Edison Co., 665 F.2d 731, 736 (5th Cir. 1982) (concluding that, under Texas law, a trade secret may be “the application of known techniques and the assembly of available components”; “a trade secret can exist in a combination of characteristics and components, each of which, by itself, is in the public domain, but the unified process, design and operation of which in unique combination, affords a competitive advantage and is a protectible secret”). Here, Intersil’s use of TAOS’s photodiode array structure is the basis of Intersil’s liability for both trade secret misappropriation and patent infringement. . . . The patent award represents an impermissible double recovery [since] ‘all of the damages awarded to [plaintiff] flowed from the same operative facts: sales of the [same] infringing [products].’ (Quoting Aero Prods. Int’l, Inc. v. Intex Recreation Corp., 466 F.3d 1000, 1017 (Fed. Cir. 2006)). Later-Acquired by Proper Means: An important question for damages: How long does the trade secret last. Here, in particular, prior to the real harm (Intersil’s contract with Apple), TAOS had already released its product and Intersil had reverse-engineered that product. Such accessibility existed no later than January 2006, when Intersil successfully reverse-engineered the TSL2560, and perhaps as early as February 2005, when TAOS “released” the TSL2560. Cost information: Not protectable because Intersil already had its own cost information by the time of the alleged misappropriation. Build-vs-Buy Analysis: Not protectable because the confidentiality agreement between the parties allowed for its use. One additional problem with the trade secret damage award: Disgorgement: The jury had awarded damages in the form of disgorging profits of the defendant. On appeal, the Federal Circuit ruled that disgorgment is not available for trade secret misappropriation (without proving that disgorgment was the proper form of compensatory damages). The result here offers an interesting historical analysis of trade secret damages. The Federal Circuit originally issued the decision in May 2017, the court has now denied a petition for rehearing en banc, but has rewritten a portion of the opinion relating to the patent damages — TAOS had asked for worldwide damages, but those continue to be denied. Intersil submitted evidence that, except for 1.2% of the accused units, all of its accused products were manufactured, packaged, and tested abroad, and those units were shipped to manufacturers and distributors abroad. . . . But even the additional evidence . . . of domestic negotiations and Intersil’s testing of some of Intersil’s products—does not demonstrate “substantial activities regarding sales” sufficient to raise a material dispute of fact as to sales or offers to sell in the United States. . . . Intersil presented evidence of extraterritorial manufacturing, packaging, and shipping, and TAOS failed to present any evidence establishing the required domestic activity. On this record, TAOS has not produced evidence sufficient to raise a material dispute of fact as to the 98.8% of units that were the subject of the district court’s grant of summary judgment. International damages for patent infringement denied. Under a theory of ‘unjust enrichment’ why wouldn’t disgorgment be the remedy? Guess I’ll read the case. Interesting case of overlap. But I would have put a little more emphasis on the Trade Secret notion of “novelty” as well as the fact that Trade Secret (currently) remains a largely State law controlled item (notwithstanding the more recent steps of creating a Federal cause of action). Texas is by no means the only State that allows Trade Secrets on combinations of items entirely in the public domain in and of themselves. Lastly, I would remind people that trade secrets – by their nature – do not (cannot) promote the progress, and thus should be a bit antithetical to a pro-patent philosophy. Certainly anyone who cares about Patent Rights and the current patent system, should not view the Justice achieved in this case primarily though Trade Secrets with any sense of comfort. Not because those rights protected under Trade Secrets are somehow improper, but because they so obviously were pursued because the protection of rights under the patent system seem a dismal failure in comparison. Insofar as the Patent system fails to protect and secure the full right to exclude others, creators will be forced to rely on other rights and courses of action in order to protect their rights to profit from their own creations. Thus to be pro-patent is to encourage a better patent system which provides rights which can compete with trade secret protection and encourage free men to choose to disclose in return. This Fed. Cir. decision also states that it is sending the case back to the E.D.TX D.C. to reconsider the prior denials of a patent based injunction and enhanced patent infringement damages. The rewriting of the patent damage portion of the May 2018 opinion (888 F.3d 1322, 1348-49), was minor and only concerned a procedural issue. The court, in the modified opinion, merely deletes from the original opinion some text stating that the patentee, in appealing the summary judgment on foreign sales, was attempting to rely on evidence that was not before the district court during the summary judgment proceeding, and noting that is not proper. The modified opinion does not change any of the substantive analysis of the patent damages issue, i.e., whether there was an act of infringement in the U.S. under an “offer or sale” for which damages could be assessed for the 98.8% excluded accused products that had been manufactured, packaged, and tested abroad, and were shipped to manufacturers and distributors abroad.